Thank you for your patronage and support, your past and future purchases are financially supporting a disabled archers to stay in the sport of archery! We have won worldwide recognition in the archery industry. This site has been visited 302109+ times. Thank you for your support! and Rated 5 stars by thousands! The advantage of the crossbow with the convenience of a vertical bow! Physically Challenged Bow Hunters of America says: Pullin bows have helped thousands of physically challenged archers across the country! We are 100% financially supportive of the physically challenged archers of America! NOTICE!!! They Asked For A Better Bow, And We Built It!!! There is Defiantly None Better! The World's Best! All products are Patented or Patent Pending! JUST ASK THE PERSON THAT HAS ONE!!!!! Are you looking for a way to continue to use a vertical bow because of a physical disability? If so, you owe it to yourself to check out the Pullin Archery Full Draw bow tensioning system. Bow held safely at full draw using the Pullin Full Draw system. This bow is legal for all states where the crossbow is a legal choice for hunters. The Pullin Full Draw Tensioning System is recognized and endorsed by the United Foundation For Disabled Archers, the Physically Challenged Bow Hunters of America, and Buck Masters because it makes the perfect bow for the physically challenged hunter. It is set up to be extremely easy on the shooter's shoulder, arm and hands. It can be converted from a regular vertical bow to the Pullin Full Draw lock in seconds and is light as a feather. It is important to note that the Pullin Conversion Kit is available for and can be added to any vertical bow, if you desire to convert one that you already have. Whether you are starting from scratch or you wish to add the Pullin concept to the bow you already use, there is a solution to fill your needs, whatever they may be. Introducing the bow of the future! Are you looking to completely replace your existing bow? The Awesome Full Draw Bow is completely compatible with the Pullin Archery full draw conversion kit. 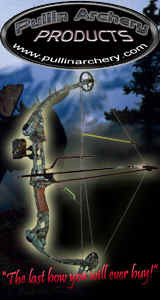 With just one bow you have the option of having a choice of using a standard hunting bow or converting it into a crossbow. Our bow has the smoothest cam on the market today, and like our conversion kit, it is designed to be easy on the shooter's shoulders, arms and hands. This bow is perfect for the physically challenged bow hunter. One man Cleaning System Save hundreds cleaning chimneys anytime. Call for details & prices. 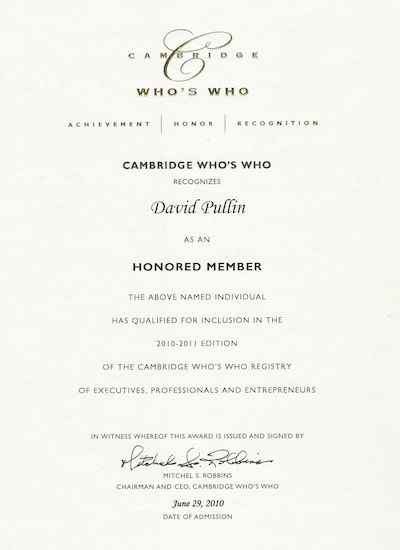 Cambridge Who's Who has inducted David Pullin into the Cambridge Who's Who Hall of Fame. He was also the 2010 Professional of the Year representing the Archery Products and Services Industry. At trade, archery, gun, and sports shows all across America and Canada the main question asked was why some companies don't build Products in the archery industry to supersede the compound bows. We listened and we did. Our thanks has been tremendous. One bow for life. We invented & patented it. Sales exceeding 1,000,000 sold directly to customers worldwide. Unbelievably not one complaint or return only promise. Remington Registry recognizes Pullin Archery Inc. for superior patented compound bows and unique releases and David Pullin himself for his recognized guest speakerships, workshops, and presentations at a number of events related to hunting, archery, FFA chapters and the assistance of disabled veterans. David Pullin was inducted into the USA Honor Society registry in 2010, representing the archery products professional community. Congratulations, You were recently chosen to represent your professional community in the 2010 Edition of USA Honor Society. The publishing committee selected you, based not only upon your current standing, but focusing as well on criteria from executive and professional directories, associations, and trade journals. Given your background the Director believes your profile will make a fitting addition to our publication. Your listing will share prominent registry space with thousands of fellow accomplished individuals across the globe, each representing accomplishments within their own geographical area. Click below to hear an interview with Mr. Pullin, conducted by Keith Carson of Allegheny Mountain Radio. To hear the audio file click here to download the MP3 file. It's very small at 1.8 MB. Copyright © 2014 - Pullin Archery Products, Inc. P.O. Box 78, McDowell, VA 24458.